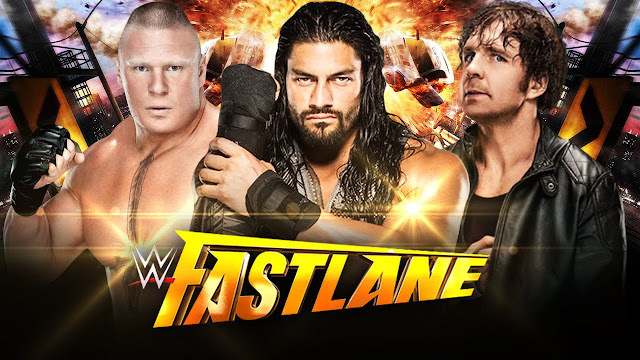 We are on the 'FastLane' to Wrestlemania where I wish I could stop, pull over, take a break and watch some NXT instead. Last year saw the now retired Daniel Bryan lose to Roman Reigns in the Main Event, in order to put over Roman and make him look good going into his Main Event match t Wrestlemania... surely they cannot to the same thing with the NEW top Babyface, Dean Ambrose.... can they? We are not going to cover the Pre Show because why would I watch that? I'm already going to be disappointed by the end of the PPV, why suffer through another hour of it? Kalisto retained his US Title against Alberto Del Rio. That's all you need to know. 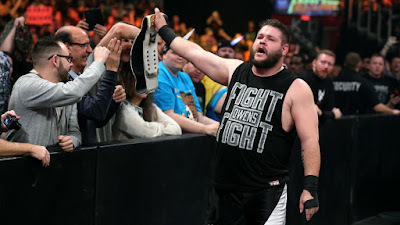 After that we got Kevin Owens defeating Dolph Ziggler in pretty decent IC Title defence. Good match, lots of impressive moves and near falls. Owens is a great heel, even shouting “your hometown loves me more than you” at Ziggler at one point. After Owens won he got up in Michael Cole’s face and showed of his Title before leaving and ripping up a fan’s Dolph Ziggler sign. Clearly this is to build up for Kevin Owens vs. Michael Cole: IC Title vs. Wrestlemania Undefeated Streak. Unfortunately, after that last match came ‘The Giants of WWE’ being Kane, Ryback and The Big Show defeating Wyatt Family (Erick Rowan, Luke Harper and Braun Strowman) Why did the match have to happen? Ryback got the pin and Strowman looked strong. That’s all I have to say about it. Charlotte defeated Brie Bella to retain her Diva’s Title in the next match. Brie looked sloppy and itwas not a very good match. They spent WAY TOO MUCH time playing up that “Brie’s husband; Daniel Bryan had to retire! And her sister is injured and had neck surgery!” to get sympathy, or pity, to make you root for her. No, that didn't work on me. The finish saw Brie put Charlotte in the ‘Yes Lock’ and then a Boston Crab as Ric Flair on the outside shouted “THINK ABOUT DANIEL” at her until she let go. Charlotte made her tap out in seconds to the Figure Eight. 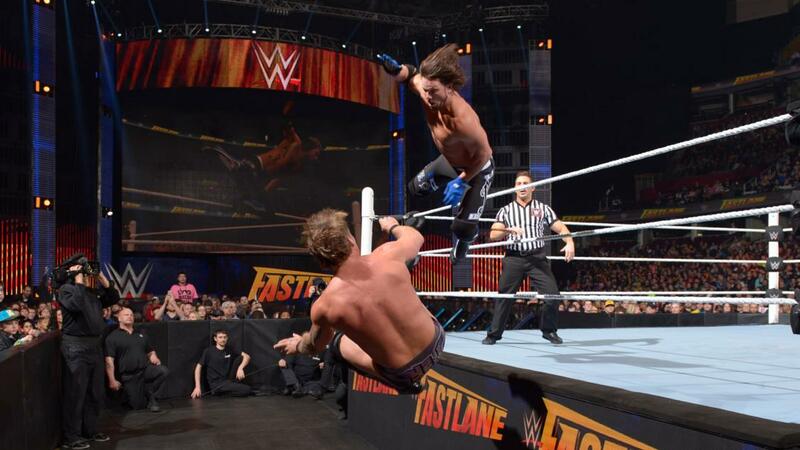 Then, AJ STYLES defeated Cool Dad; Chris Jericho. This match was great, but there were a few mistakes in there with ‘botches’, including where one AJ hit a Springboard Moonsault and Jericho failed to catch him properly - looked painful. Also, AJ STYLES HIT A PPV STYLES CLASH AND JERICHO KICKED OUT! This is only the SECOND time he has hit his ‘Finisher’ and the first time it’s been on PPV and Jericho kicked out only to tap out to the Calf Crusher seconds later? WHY?! Jericho did a great job selling the submission and teasing tapping out before he did and then teased attacking Styles after the bell before offering him a handshake. This match is worth the watch. After this there was AWFUL segment between Edge and Christian and The New Day that went on WAY too long. A lot of people thought that E&C (Edge and Christian) would debut the new E&C being Enzo Amore and Colin Cassady for a feud with the New Day to Wrestlemania! But no, WWE don’t want to give us good things. Then, to kill the mood even more Curtis Axel and the Social Outcasts; Bo Dallas, Heath Slater and Adam Rose beat R-Truth in a match just to further the storyline between R-Truth and Goldust where Goldust is trying to get Truth to team with him and form ‘The Golden Truth’ but fails each time, this time by costing Truth the match. The only up side to this segment was THE SOCIAL OUTCASTS GOT A WIN ON A PPV!! 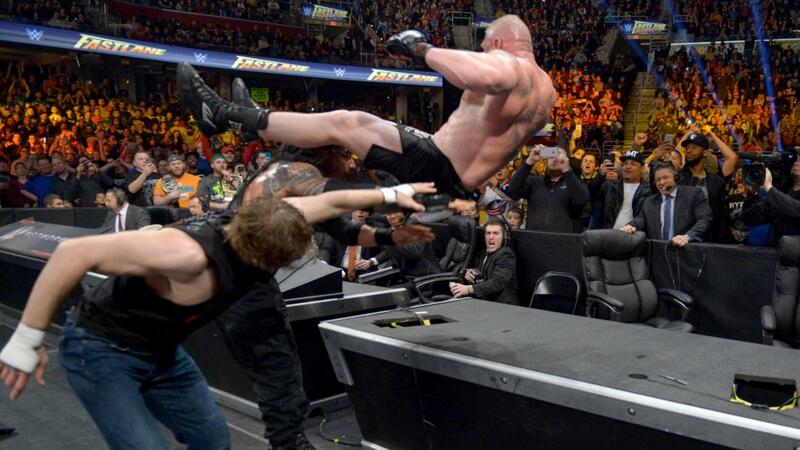 Then, it was time for the Main Event where Roman Reigns defeated Dean Ambrose and Brock Lesnar…. URGH… This match saw Lesnar hit suplex after suplex and shoot knees on Roman and Dean, keeping them separated until they managed to team up and put him through the announce table. Twice, allowing them to brawl. The finish saw Lesnar get back in the ring after being put through the tables, where Dean then unloaded a bunch of chair shots on him, causing him to roll out of the ring, and Roman who got up and speared him for the 3 count. When will they ever learn…?